It’s springtime, and love is in the air! It’s wedding season, and we know you’re putting together some great ring displays. Want to know some of our favorites? Finger Displays. 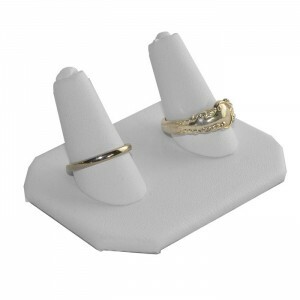 This type of display is excellent for showing ring sets, or a line of wedding rings or bands. 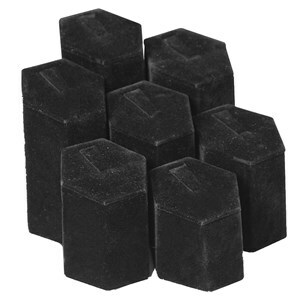 These work well in a showcase or on a jewelry display table, and come with a few options. There’s the single ring finger display, the double, the five-finger and the 12-finger ring display. The smaller finger displays are best suited for wedding sets, or special engagement rings you want to set apart from the others. The larger displays work very well for displaying different styles of rings or organizing them by cut, carat, or color. Dual ring finger displays are perfect for wedding sets! Jewelry Boxes on Risers. This works very well for window displays and creates an elegant, eye-grabbing look that will draw your customers in for another look. Find a riser set and some high-quality jewelry boxes that matches your decor, arrange in your front window and display your rings! 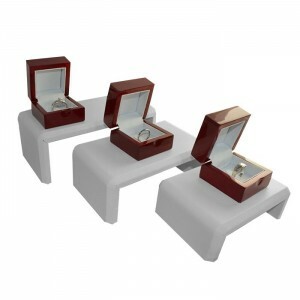 Jewelry boxes on risers are a great ring display! Ring Risers. There are risers that are specifically created for rings. They typically have a ring flap, and you place the ring behind this ring flap to keep it secure. This look works well for both window displays and even inside of a showcase. Slot Displays. This type of display is ideal for use within a showcase and perfect for displaying a line of engagement rings or wedding bands. These are typically angled displays, which makes it easier for your customers to view and browse your jewelry. Rings easily slide into the slots on the display, and are easy for you to remove and show to interested customers. 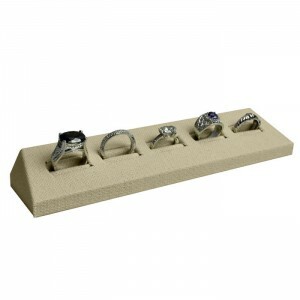 Five slot ring displays are excellent for a line of engagement rings or wedding bands. Those are a few of our favorites! What are your favorite ways to display rings for wedding season (or any time of the year)? This entry was posted in Displays, Featured Product, Uncategorized by gemsblogadmin. Bookmark the permalink.